Cold's Gold Factory - WoW AH & Hearthstone Tips, Heroes of the Storm: Firelands Dailies: Got My Flameward Hippogryph Mount. Now What? Firelands Dailies: Got My Flameward Hippogryph Mount. Now What? I have finished all of the quests associated with the Firelands Invasion Dailies that were added in WoW Patch 4.2. I am now the owner of a new mount, the Flameward Hippogryph. The Flameward Hippogryph is your reward for completing the Cataclysm achievement The Molten Front Offensive. The Molten Front Offensive achievement requires you to unlock each of the phased vendors and complete all of the quest chains, then you are rewarded with the Flameward Hippogryph mount. In my opinion this mount is ugly, but it still counts towards the Mountain of Mounts achivement. So I'm happy with it. My question is now what do I do? What To Do Now That Firelands Dailies Are Completed? Well, there is the Flamebreaker title that can be earned once you complete the achievement Veteran of the Molten Front. Many of the achievement requirements will already have been completed once you have finished unlocking all of the vendors and all of the quest phased areas of the Molten Front. Finishing off the left over achievement requirements will require completing more of the daily quests, which will continue to reward you with Marks of the World Tree. Continuing on to complete even more Firelands Dailies for the achievements and title will lead to the accumulation of extra Marks of the World Tree. While these where originally used for unlocked the various quest phases, once everything is unlocked there isn't much use for the extra Marks of the World Tree. There is a vendor named Zen'Vorka located within the Molten Front that will trade you 1 Zen'Vorka's Cache for 30 Marks of the World Tree. You can also raise reputations by buying the various Writs of Commendation, which award 250 reputation to a major city, but by this point you probably don't need reputation with your faction's major cities. Inside the Zen'Vorka's Cache you will find a random piece of Cataclysm gear or an Elementium Lockbox with a piece of random Cataclysm gear inside. 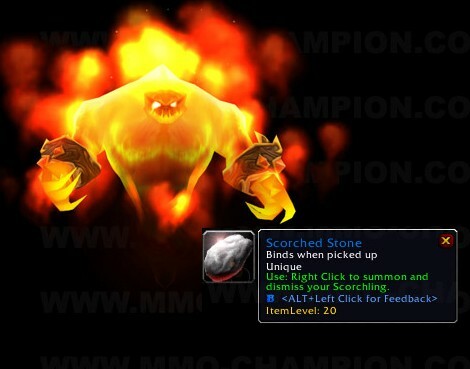 If you get lucky, you could also find a Scorched Stone, which awards a companion pet. This miniature fire elemental vanity pet should serve to remind you of all of the elementals you have to kill while completing all of the beginning Firelands Dailies over and over. Zen'Vorka's Cache is an option for getting something for all of the extra Marks of the World Tree that you will collect while wrapping up your achievements or farming for your Scorched Stone companion pet. Outside of those 2 reasons for collecting Marks of the World Tree, I can so no reason to continue farming the Marks of the World Tree just to get more Zen'Vorka's Cache, or as they should be named: Zen'Vorka's Disenchanting Trash. So don't waste any more time that you have to collecting extra Marks of the World Tree. It's time to break out my crafting alts that haven't unlocked the appropriate vendors so they can start crafting the new epic items and the new bags introduced on the phased Firelands vendors. My blacksmith is currently on phase 2 of the Firelands Dailies and my bag crafters haven't even started the Firelands daily quests yet. So I have plenty more elemental slaying, seed planting, mob bombing, spider killing, wound bandaging, bird flying, turtle kicking fun ahead of me. Oh, joy! Anyone else sick of these dang Firelands daily quests? Now watch Blizzard make unlocking all of the Firelands Daily phases a requirement for the next round of incoming content. Enjoy The Posts Here at Cold's Gold Factory? Check Out Cold's Mysterious Fortune Card Mastery Gold Making Guide To Get You Started. This Guide Can Be Applied To Multiple Markets Not Just Barking MFCs. Also they are a nice bonus for someone with skinning (spiders and scorpions). Yes, I too am sick of them. Have completed them on 4 of my 7 85s. 75% done on 1 more, 50% done on 1 and 25% done on 1. As was said above though, my skinner I think will continue to do them at least a few times per week. If I go during the busy time (when others are doing it), I can collect tons of spider skins (hmmmm interesting there) by just running around. I've collected over 100+ skins in under 5 minutes before. Guest Post: Beware The Crossfaction Gotcha! Patch 4.3 Transmogrification: Profitable Or Not?